If you’re looking to buy the best dog food for Yorkies, it’s crucial that you understand this breed and their unique dietary needs. As one of the most popular small and toy dog breeds, the Yorkshire Terrier has many high-quality dry and wet dog foods specially formulated to keep him healthy and fit. If you aren’t sure what to feed Yorkies but you know choosing the best food for your Yorkie is important to you, this guide is worth a read. Below, we’ll discuss what makes a good dog food as well as make some recommendations on the top-rated brands for Yorkie puppies and Yorkies with allergies. 5 What Makes A Good Dog Food for Yorkies? 6 What Is The Best Dog Food for Yorkies? Affectionately known as the Yorkie, the Yorkshire Terrier is a teacup or toy breed with a long, silky coat of silver and tan. These dogs may be small, but they have big personalities, and they absolutely love to spend time with their family. Yorkies are the epitome of being a little dog in a big dog’s body, and you aren’t likely to forget it. Yorkies only weigh between 4 and 7 pounds at maturity, so they don’t eat nearly as much food as larger breeds. Even so, quality nutrition is of the utmost importance for these little dogs. Your Yorkie’s diet needs to provide for his nutritional needs as well as his energy requirements, so choose carefully! Here, you’ll find some useful information about your Yorkie’s diet and nutrition as well as some tips on what to feed her to ensure she gets the healthiest, high-quality dog food. After all, regardless of whether you have an adult Yorkie or just a new puppy, the best dog food brands and products can help your pet live a long and healthy life. To make sure that you get to enjoy as many happy years with your Yorkie as possible, take the time to choose a good dog food formula that meets his nutritional needs. Like all dogs, Yorkies have specific needs for protein and fat in their diet as well as vitamins and minerals. Protein helps support your Yorkie puppy’s growth and development, and then, in adulthood, it helps him maintain lean muscle mass. In fact, protein is made up of amino acids of which there are twenty – your dog’s body can synthesize 10 of them, but the other 10 (called essential amino acids) must come from his diet. The best sources of protein for dogs like the Yorkie are animal sources like poultry, meat, and fish. As a puppy, your Yorkie requires a minimum of 22% protein in his diet, but he only needs a minimum of 18% as an adult. After protein, fat is the next most important nutrient – your dog needs 8% as a puppy and 5% as an adult. While you may think of fat as something unhealthy, it is extremely important for dogs because it provides a highly concentrated source of energy. Fats in your Yorkie’s diet should come from healthy sources like chicken fat or salmon oil, though plant-based fats like flaxseed can be beneficial as well. After your Yorkie’s needs for protein and fat are met, you can start thinking about other nutrients like carbohydrates, vitamins, and minerals. Dogs do not have specific needs for carbohydrate in their diet and, in fact, some animal health experts suggest that they can do fine with no carbohydrate intake at all. In a dog’s diet, carbohydrates can provide energy in the form of calories as well as vitamins, minerals, and dietary fiber. You just need to make sure that it comes from digestible sources like fresh vegetables or cooked whole grains. Most dog food formulas also contain vitamin and mineral supplements for nutritional balance, though natural sources like fresh fruits and vegetables are preferable. The best supplements for dog food are chelated minerals – these are minerals that have been bound to protein molecules which makes them easier for your dog’s body to digest and absorb. One of the most important things you need to know about feeding your Yorkie is that his metabolism burns through energy very quickly – this is just a biological characteristic shared among small- and toy-breed dogs. This being the case, you should divide your Yorkie’s daily portion into three feedings, so his body will have a steady influx of energy throughout the day. You could also just keep your dog’s bowl filled or use a gravity feeder to ensure that he has food available whenever he gets hungry. This will only work as long as your dog is able to control his own feeding and he doesn’t gain too much weight. When shopping for a dog food formula for your Yorkie, the nutritional content and ingredients are the most important factors to consider. Once you’ve chosen a recipe, however, you should look at the calorie content to determine how much to feed your Yorkie. Small breeds need about 40 calories per pound of body weight per day. So, for the Yorkie, that gives you a range of about 160 to 280 calories divided over three meals. You’ll need to check the individual food package to see the calorie content and then do some basic calculations on your own. 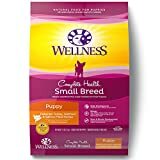 You could also just follow the feeding recommendations on the package according to your Yorkie’s weight and age, but you still need to keep an eye on his body weight and composition to make sure he doesn’t get too much or too little food. Unfortunately, small dogs often come with big health problems, and the Yorkshire Terrier definitely fits into that category. Having such a small frame, toy breeds like the Yorkie are prone to dental issues as well as skeletal problems. Dental issues in Yorkies often occur when the baby teeth don’t fall out before the adult teeth start growing in – this can lead to crowding and retained teeth, both of which increase the risk for tooth decay. Other health problems known to affect the breed include bronchitis, cataracts, portosystemic shunt, and genetic disorders like hydrocephalus, distichiasis, Legg-Calve-Perthes syndrome, and patellar luxation. They are also prone to allergies. What Makes A Good Dog Food for Yorkies? A quality dog food for Yorkies is one made with the best ingredients – it is as simple as that. When reviewing the label for any dog food product, you want to check the guaranteed analysis as well as the list of ingredients. The guaranteed analysis tells you how much protein, fat, moisture, and fiber the product contains – it may also show the content of certain vitamins and minerals. The list of ingredients is self-explanatory, but you should know that it is arranged in descending order by volume – the ingredients at the top of the list are used in the highest volume. When you look at the label for any dog food product, you want to make sure that it contains a minimum of 18% crude protein and 5% crude fat (22% protein and 8% fat for puppies). When it comes to these nutrients, however, more is always better. This is particularly true for fat content because Yorkies have very fast metabolisms and fat provides a concentrated source of energy. When reviewing the ingredients list, look for a high-quality source of animal protein at the beginning with digestible carbohydrates and healthy fats within the next few ingredients. In addition to making sure that certain things appear on the ingredients list for your Yorkie’s food, you should also make sure that certain things do NOT appear. For example, avoid any product made with corn, wheat, or soy – especially if these ingredients appear near the top of the list. You should also avoid products made with GMO ingredients and artificial additives like colors, flavors, and preservatives. As a rule of thumb, you should avoid any ingredient that you can’t pronounce or that you can’t identify. When shopping for dog food for your Yorkie, the best place to start is with a small- or toy-breed formula. These recipes contain plenty of protein to support your dog’s lean muscle mass with higher levels of fat to fuel his fast metabolism. Here are our top recommendations for high-quality small-breed dog foods for Yorkies. This Classic Small Breed Recipe from Merrick features deboned chicken, chicken meal, peas, turkey meal, and brown rice as the top five ingredients. Loaded with 30% protein and 10% fat, you can rest assured that this formula will do more than just meet your Yorkie’s nutritional needs – it will exceed them. This formula is packed with protein and healthy whole grains as well as fresh fruits and vegetables for nutritional balance. It also contains chelated minerals for maximum absorption and probiotics to support healthy and regular digestion. 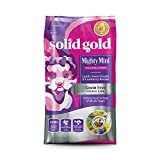 While small-breed dog food recipes are common, formulas for toy breeds are less so, which is part of what makes this Solid Gold Holistic Dog Food for Small & Toy Breeds such a great option. This recipe is made with both fresh chicken and chicken meal as well as dried eggs and ocean fish meal for a total of 30% crude protein. For healthy fats, it relies on chicken fat and salmon oil as well as almond oil and sesame oil. With plenty of fresh fruits and vegetables included, this recipe also ensures nutritional balance through natural sources, though there are vitamin and mineral supplements as well. 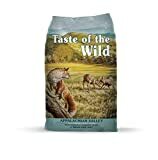 If you’re looking for a high-quality small-breed recipe made with unique ingredients, look no further than this Taste of the Wild Appalachian Valley Small Breed Formula. This recipe features venison and lamb meal as the main proteins with eggs, duck meal, and ocean fish meal for support. Canola oil is the main source of fat, and there are plenty of digestible carbohydrates in the form of gluten-free, grain-free veggies, beans, and legumes. This product provides 32% protein and 18% fat and is supplemented with chelated minerals and probiotics. Puppies grow up fast, and this is particularly true for small-breed puppies, especially when their maximum weight is less than ten pounds. To make sure your Yorkie puppy gets the energy and nutrients he needs to grow and develop, choose a small- or toy-breed puppy formula. Here are our top three recommendations for high-quality puppy food recipes for Yorkie puppies. With deboned chicken as the first ingredient, you can rest assured that this Blue Buffalo Life Protection Small-Breed Puppy Formula will support your Yorkie puppy’s healthy growth and development. It contains 29% protein and 17% fat as well as chelated minerals, vitamin supplements, and probiotics. In terms of its benefits, this recipe supports brain and eye development as well as healthy muscle growth and strong bones and teeth. Also, it is free from corn, wheat, and soy as well as artificial colors, flavors, and preservatives. Made with fresh chicken and chicken meal, this Diamond Natural Small-Breed Puppy Formula is packed with 32% protein and 22% fat. It features digestible carbohydrates like white rice and pearled barley as well as nutritious fats such as chicken fat and salmon oil. Made with a variety of fruits and vegetables, this recipe provides natural sources of key nutrients in addition to supplements like chelated minerals. Overall, it is a quality source of nutrition that your Yorkie puppy would be lucky to have. 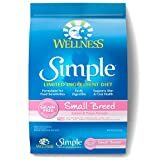 Designed to support the unique nutritional needs of growing small-breed puppies, this Wellness Complete Health Small Breed Formula features deboned turkey, oatmeal, and salmon meal. Not only is this recipe packed with protein, but it is loaded with digestible carbohydrates and fresh fruits and veggies. This recipe is rich in healthy fats and supplemented with calcium and phosphorus for bone growth plus DHA for brain development. It also contains dried fermentation products which are probiotics that support healthy digestion. The Yorkshire Terrier has a very delicate digestive system that is easily upset if the dog consumes something outside of its regular diet. If your Yorkie eats something he shouldn’t, he may develop vomiting or diarrhea. Food allergies are another matter entirely, and they are more likely to trigger skin-related symptoms than digestive upset. If your Yorkie develops chronic ear infections and itchy or inflamed skin, it could be an allergy. Some of the most common food allergens for dogs include beef, dairy, eggs, wheat, chicken, and soy and, in many cases, dogs are allergic to more than one thing. 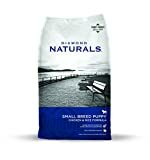 Uniquely formulated for small breeds, this limited ingredient diet from Wellness features salmon and potato as the main ingredients. Not only does this recipe contain fresh salmon, but salmon meal is the second ingredient, so you can rest assured that it is packed with protein. When it comes to healthy fats, this recipe relies on canola oil and flaxseed on top of the omega-3s from the salmon. This recipe is fortified with chelated minerals and probiotics, but the list of ingredients is very short excluding these and other supplements, reducing the risk that it will trigger an allergic reaction in your Yorkie. Previous Post: « Can Dogs Eat Pizza?